Gadget nuts and adrenaline junkies, add this one to your Christmas list. One inventor has created what every 80s kid wanted when they first saw Back to the Future Part II. Yep, the hoverboard is a thing folks, and here's the proof. Marty McFly and Doc Brown would be proud. A Canadian inventor named Catalin Alexandru Duru has done the impossible, and built a fully-functioning hoverboard. Not only that, but he's also achieved a place in the Guiness Book of World records. Duru is the first official person ever to break the Guinness World Records title for the farthest journey by hoverboard. To qualify for the record, Duru only had to fly a distance of 160 feet. Well, he didn't do that. Instead, Duru smashed the record to pieces and managed a whopping 905 feet. 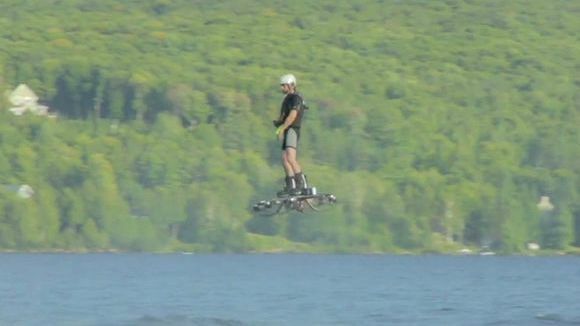 The feat was performed over a lake in Quebec, with the Guiness Book of World Record reps filming the action. The hoverboard is just a prototype at this point, but nevertheless groundbreaking. There aren't too many details regarding its design, but it looks like a series of propellers are affixed underneath for it to take flight. Don't bank on it ever making it to market, but just try and enjoy the fact that hoverboards are actually possible. Gutted it's not on Amazon? Read our pick of the 10 coolest movie gadgets you can actually buy. And be sure to watch the video below to see the record go down.